than the tips of your fingers! "...unlike anything I have ever experienced! "- Katie B. It's the tectonic plates of modern medicine rumbling and shifting, as more and more people discover the profound benefits of energy medicine and energy psychology. Here in the West, as you know, health challenges and psychological issues have traditionally been treated with medication or expensive therapies. But in the East, for thousands of years, they've taken a very different approach. They prevent these problems instead, by treating the body's energy systems. At last, Westerners in massive numbers (including many medical professionals) are finally realizing just how smart and effective this safe, natural, intuitive approach to health and wellness really is. Just a couple of decades ago, for example, yoga, meditation, and acupuncture were considered unconventional. Now, they're widely practiced and recommended. Today, I'm writing to let you know about another outside-the-mainstream health and wellness process that is rapidly growing in popularity for one simple reason: IT WORKS. If done right, this process has a success rate of as much as 95% — much higher than medicine, therapies, peak performance techniques, or even motivational and achievement coaches. Eighty thousand practitioners in more than 57 different countries worldwide currently use this process. It's routinely being used to treat post-traumatic stress disorder (PTSD) in returning combat veterans of Iraq and Afghanistan. And many professional actors and performers are discovering its power as well. Ben Affleck and Matt Damon used it to quit smoking; award-winning actor Laurence Olivier used it and singer Michael Ball has used it to calm their nerves before going on stage; and even Madonna is reported to benefit from its regular use. But because this process reduces or even eliminates the need for conventional medicine or therapy, the multibillion-dollar pharmaceutical industry will never allow it to become mainstream. You'll never find a clinic that offers it opening its doors in your community. Which is why it's almost impossible to learn how to correctly apply these incredibly potent, yet extremely precise techniques... that is, until NOW! Rooted in ancient China and India, acupuncture has been effectively used for 4,000 years. Like acupuncture, EFT touches your energetic anatomy — your vital energy channels called "meridians" — which are the cornerstone of life and essential to your health, vitality, and happiness. Dr. Lee Pulos, a clinical psychologist and author of multiple bestselling Nightingale-Conant products, including The Power of Visualization, was one of the pioneers of this powerful technique. In speaking about EFT, Dr. Pulos says, "Of all the sciences, medicines, and techniques I've used, this is one of the most extremely useful and powerful self-help, educational, and easy-to-learn techniques I have ever taught and utilized." With EFT, you can program yourself to overcome your most challenging obstacles and reach your elusive personal goals. You'll be able to achieve peak performance in most everything you do, and start to heal any pain, problem, or trauma you face. You can overcome your fears, eliminate your stress, and transform negative core beliefs into positive, beneficial beliefs that enable you to get what you truly want. And that's just a fraction of what you'll be able to do to noticeably change your life — quickly, effortlessly, and effectively — just as soon as you learn this radical, proven technique. Stephen L. encouraged his client to use EFT. Minutes later, his client's golf game significantly improved, and he "forgot" to smoke after smoking cigarettes for 20 years... quitting with zero effort! Deathly afraid of heights her entire life, Suzanne L. "cured" herself in one minute flat using EFT, and then peered over the edge of the Grand Canyon, smiling the entire time. Mark E., an amateur bowler, used EFT just minutes before his game. And then accomplished one of the most difficult feats in all of sports... scoring a perfect 300 game. April R.'s husband had back pain so severe, he could only crawl. After just one session, his pain went from a "screaming 25" to a "barely noticeable 3." And by morning, the pain was GONE! As amazing as these case studies are, they aren't unique. Hundreds of thousands of people have experienced incredible healing life changes using this very technique. More importantly, the annals of scientific journals cite volumes of research, studies, and tests that prove it's NOT theory, coincidence, or pseudo-science. And now available to you. Right now, extraordinary abilities, vibrant health and energy, and calm, confident control are TRAPPED within you. Likewise, the answers and solutions to your problems, fears, and challenges are BURIED within your body and mind. These are your "hidden reserves" — where your greatest potential resides. People spend a lifetime trying everything to tap into these reserves to unleash their potential. Through therapies. With medications. By devoting thousands of dollars and years of learning, training, and practicing... many times, still coming up short. EFT gives you an easier way — a shortcut beyond belief — to tap into your hidden reserves and release the health, peace, and personal power you seek. One that takes minutes, not months, can be done anytime, anywhere, and is reported to be effective 95% of the time. As you sit there, think about the pain in your life. Maybe it's physical pain — such as a nagging backache, an arthritic knee, or recurring headaches. Perhaps it's emotional pain — a childhood memory, suppressed anger, guilt, or anxiety. Now think about your brightest future. The achievements that will make you beam with pride. Transforming your negative thoughts to empowering beliefs. Enhancing your self-esteem and performing at maximum efficiency. Now imagine you stand up. You take a deep breath. Then you start tapping a precise point on your body with your fingertips. That's right. Tap, tap, tap, tap, tap. To someone unaware of this breakthrough scientific technique, it may seem as if you're simply tapping your body. But you know it goes much deeper. Because you know, with every tap... well, you're essentially changing your life. Tapping away any potential roadblocks, fears, and stress that have stood in your way of reaching your highest potential. Tapping in a confidence and a belief system that breathes life into your optimal future. Tapping away your pain, harmful emotions, and any addictions that smother you. Tapping in greater focus and concentration so you are poised to finally reach the goals that used to be just out of reach. After a few quick minutes of tapping, an invigorating energy washes over you. Suddenly you are more alert, more focused. Your body, mind, and soul are refreshed and rejuvenated... as if you just experienced an hour-long deep-tissue massage. Most importantly, the pain or emotional conflict you just tapped... has subsided, or disappeared altogether! Or the areas of peak performance and personal achievement you have tapped... are now firing on all cylinders! What will EFT do for YOU? weeks, months, or even years to achieve! EFT: The New Technology for Immediate Healing and Vitality. As chairman of Nightingale-Conant, I naturally have an affinity for all of our programs. But it's hard to ignore the excitement and possibilities surrounding this one. 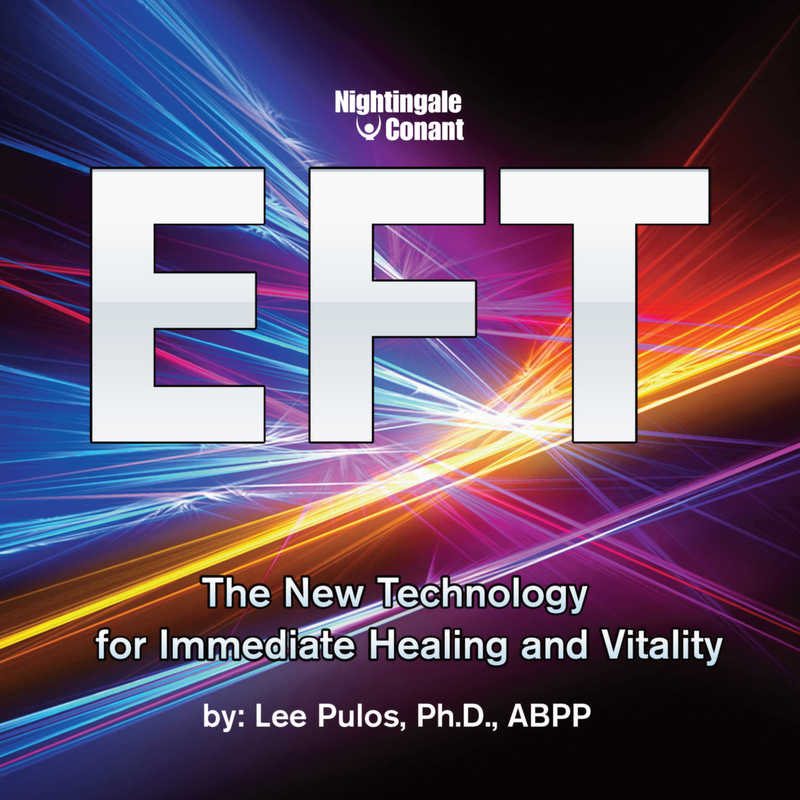 For the first time ever, Dr. Pulos is giving you an exclusive behind-the-scenes look into all things EFT. In these 12 unforgettable sessions, you'll gain everything you need to know to be able to master EFT for success and vitality for yourself as well as for your family and friends. You'll discover many real-world examples of people who have used EFT to significantly enhance their lives. You'll realize the nearly unlimited areas of your life that can be strengthened and improved with just one or two EFT sessions — from overcoming a fear of public speaking, to enhancing your eyesight, to alleviating common cold symptoms, to helping you lose weight. You'll receive a DVD that demonstrates, step by step, the remarkable power of EFT in front of a participating audience. Plus, you'll receive a workbook featuring a detailed chart showing you precisely where and how to tap in order to gain the results you want. It's like having a mind-enhancement program, achievement program, health and vitality program, and spiritual program... all wrapped into ONE. YES! I want to INSTANTLY rejuvenate my body and mind! The new science of neuromagnetics suggests that we are magnetic beings. Every cell in our body is a miniature magnet or battery, with positive and negative polarities. Sixty to seventy TRILLION of these mini-magnets are inside you right now. For 4,000 years, teachings from China have proven these mini-magnets essentially create rivers of energy called "meridians" along which our vital force flows. Therefore, connecting to and stimulating these meridians is the secret behind unleashing a sharper, stronger, and superior version of yourself. And the key to energizing these meridians is by applying pressure to tiny pinpoint-sized triggers called acupressure points, or acupoints. Using Dr. Pulos' techniques as well as the detailed charts provided with our EFT audio program, you'll discover precisely which acupoints connect with which of your body's meridians—resulting in the life changes you seek. For example, somewhere on your body is an acupoint that, when tapped, will instantly decrease your stress, eliminate your fears, and alleviate any addictive cravings you have. Likewise, you also have an acupoint that immediately reduces your feeling of nausea or sea sickness, just as soon as you start tapping. Another acupoint eliminates your sense of guilt and grief. Still another alleviates sexual tension. And another engages your goal-achieving abilities. All told, there are 350 acupressure points on your body... many of them directly connected to either physical or emotional improvements. So just as soon as you learn where and how to tap these tiny acupoints, you'll have the power to create a healthier, happier, more successful future. One of the reasons for EFT's extraordinary results is that as you are stimulating the sequence of acupressure points, the brain releases beta endorphins into the bloodstream. Beta endorphins are the most powerful natural morphine molecules... 27 times more powerful than synthetic morphine. In EFT, Dr. Pulos teaches you each of the following incredible techniques. Use them to achieve your greatest potential. Or to simply amaze your family and friends. Have you ever SEEN your aura—that subtle body of energy surrounding your body? Now you WILL! Dr. Pulos shows you the simple steps to living this magical experience. Your EARS hold the secret to radically increasing your energy throughout your body! That's right, do THIS with your ears each morning, and you'll be on fire all day long! Project energy from yourself to your family or friends... using nothing more than your MIND! It's true. In just 20 seconds, this one shocking trick PROVES without doubt there is a biomagnetic field within your body. Discover the must-experience-to-believe Belly-button Correction Technique! Engaging in this quick exercise "unkinks" the blockages of energy flowing through your body. Essential to your EFT success! Dr. Pulos teaches you another Energy Psychology approach called the Tapas Acupressure Technique (TAT). Thousands of TAT practitioners have used this technique to alleviate anxieties, phobias, trauma, and negative beliefs, and even to successfully treat allergies. You may THINK you know your beliefs... but your body may know DIFFERENTLY! You'll learn a simple Muscle-Testing Technique that is as effective as a lie detector test. Use it on yourself, your spouse, or your friends. EFT is incredibly effective in eliminating addictions. If you smoke, drink, overeat, or engage in most ANY damaging addiction or habit, this program could be the answer you've been looking for. Learn how to engage in Self-Hypnosis... it can become a very powerful tool in helping you reach your goals. It's been proven that animals have the same meridian points as you! Therefore, you can actually modify the behavior and temperament of your dog or cat using Dr. Pulos' universal techniques. In addition to your body's 350 acupoints, you also have two Extraordinary Points designed to combat stress, fear, and addictive tendencies. Few people know about these — but Dr. Pulos shares them with you! You'll learn ALL of these techniques PLUS MORE! Add them to your EFT arsenal of healing and empowerment, and you'll be unstoppable! inner strengths I never knew I had." Years ago, I witnessed one of the most curious and amazing demonstrations that I'm convinced to this day significantly altered someone's future. Dr. Lee Pulos was in Chicago recording his bestselling program The Power of Visualization. That night, I treated him, as well as several of our Nightingale-Conant team members, to dinner. During dinner, one of our employees admitted he had major debt problems, had maxed out his credit cards, and was beginning to feel like a failure. Of course, we all offered comforting words. Except for Dr. Pulos. Because what he offered was something much more... an immediate hands-on solution! Yes, in the middle of the restaurant, just a few feet away from other patrons, Dr. Pulos asked this young man to stand up. None of us knew what to think. But our team member was willing to try anything. First, Dr. Pulos muscle-tested him, revealing that he did not believe he could get out of debt. Then Dr. Pulos engaged in EFT, focusing on diminishing his negative belief. Six months after experiencing EFT for the first time, our team member had dramatically reduced his debt, paid for his own wedding in cash, and felt a continuous burst of confidence and accomplishment. In his own words, he said, "The EFT experience put me in touch with inner strengths I never knew I had." And today, he is completely out of debt, is happily married, has three children, and is one of the top executives here at Nightingale-Conant! And all of us who witnessed his "three-minute transformation" know that EFT is one significant reason for his success. Listen to Dr. Pulos share the many ways EFT can change your life. Watch the DVD to witness live demonstrations of EFT in action. And use the guidebook to pinpoint the precise acupoints you will tap for maximum results. The techniques are proven. The effectiveness is unbeatable. But it's the RESULTS that are drawing the attention from hundreds of thousands of people worldwide. If you've been waiting for "the next big thing"... I'm confident that this is it! There may be a part of you that may still be a little unsure. That's a perfectly understandable reaction to something new and life-changing. Our employee had the same reaction. As he was standing in the middle of the restaurant, I caught him rolling his eyes once or twice. But he took a chance... and now his life is better because of it. Yours will be too! Go ahead and take this RISK-FREE opportunity to try the technique that sharpens your mind, strengthens your body, and enhances your future. I look forward to hearing about the results you achieve using EFT! I want to TAP into my mind and body's trapped energy reserves — to quickly and easily restore health, joy, calm, focus, confidence, balance and MUCH MORE. A clinical psychologist. A master educator. A bestselling author. A peak performance coach. A leading authority on personal development. That's Dr. Lee Pulos. Dr. Pulos was awarded a Diplomate in Clinical Psychology by the American Board of Professional Psychology (ABPP) and is currently Clinical Assistant Professor Emeritus in the Department of Psychiatry at the University of British Columbia. In addition to his clinical interests, Lee has served as Sport Psychologist for Team Canada and has worked with dozens of Olympic and other world-class athletes. He's conducted hundreds of seminars for Fortune 500 companies on the subjects of Peak Performance, Goal Setting, and Self-Esteem Psychology. Author of the bestselling Nightingale-Conant program The Power of Visualization. He has appeared on numerous TV shows and radio programs, and has been featured in many publications.